If ever there was a complete change in lifestyle, it was this! 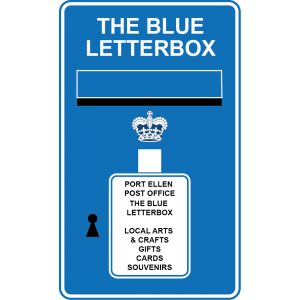 We are Ruth and Alan and we own The Blue Letterbox and run Port Ellen Post Office. 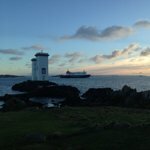 We are not Ileachs (the people born and bred on Islay) but moved here from Northern Ireland a few years ago. Alan was a chartered civil engineer, working away in a big office in Belfast. Ruth was a stay-at-home mum, bringing up three daughters, who were moving on to college or high school. Bored engineer and bored housewife make a case for a change! 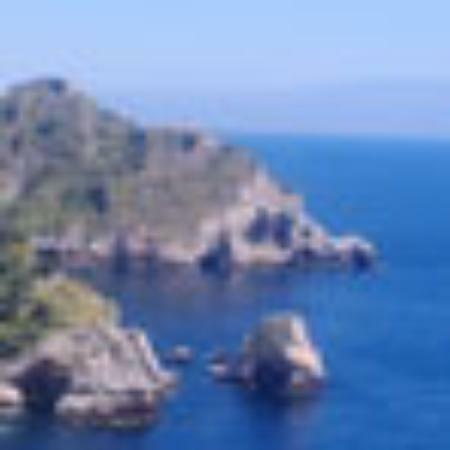 Why Islay? We’d been coming here for holidays for quite a few years, encouraged by Ruth’s cousin who came here on holiday nearly every year until they too moved here. We were originally looking for a house to buy as a holiday let, but spotted the sale of the building that housed the Post Office instead. And so the idea for a change was born. 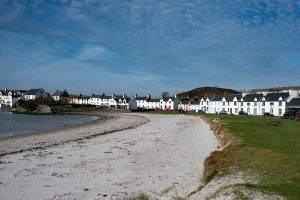 Port Ellen is a small village with just a few shops, two hotels, some B&Bs, a pub, a community run filling station, the ferry port and marina. 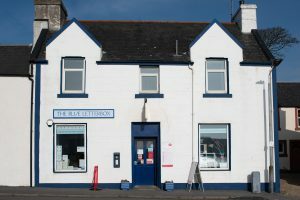 It also had a Post Office that the local community were desperate to keep open, having already lost their bank. Also there wasn’t anywhere that folk could buy a souvenir or present, be they a visitor or a local. The building that housed the Post Office was big and underused. Seeing its potential, we took a sledgehammer to the walls, evicted a few spiders and opened it up to reveal a big, light and airy space. 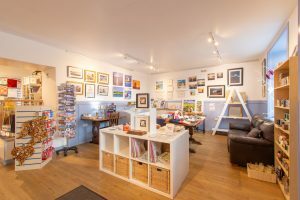 Just the thing to showcase Islay’s remarkable locally made art and crafts. It also has a nice, new, modern Post Office counter. Taking on the Post Office and starting up a brand new business has been no mean undertaking. Along with the move, leaving our eldest daughter at college in Northern Ireland; uprooting our middle and youngest teenage daughters to a new high school with a different education system, moving two cats and not having a house to move into has not been easy. But with help and encouragement from so many people, here we are, with an up and coming gift shop, a Post Office, and our own (soon to be completed) house. We have been warmly welcomed here by our little community and are now happily living in this wondrous place. Best lifestyle change ever!